I’ve previously posted about the myriad of choices in beehive foundation. This post is about an experiment I’m running this year with Foundationless Frames and Frames Hung With Half-Sheets of Wax Foundation. I’ll call these “Half-Hung” frames to make writing easier. (By the way, the Paria Canyon post is still to come, there are just so many wonderful pictures to sort though – and foundation is way more relevant to beekeeping). Foundationless Frames have always seemed to me to be an attractive option. The bees get to build what they want to build. I don’t pay for foundation. But it has never been terribly successful for me. 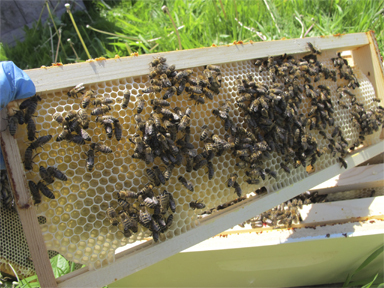 Often the bees just ignore the foundationless frames and work on all the other frames. Two years ago I worked with a beekeeper friend, Clyde. Clyde works with small cell foundation in deeps, but he only places foundation on the top half of the frame. 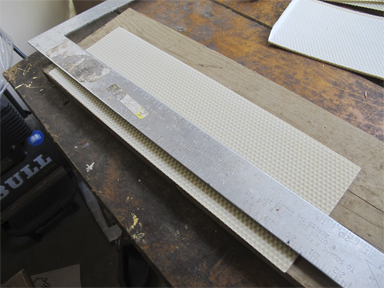 This technique seemed attractive as well : bees get to build what they want on half the frame, and foundation for each frame costs me 50% less. I know I sound mercenary, but it can be challenging making a living as a beekeeper. 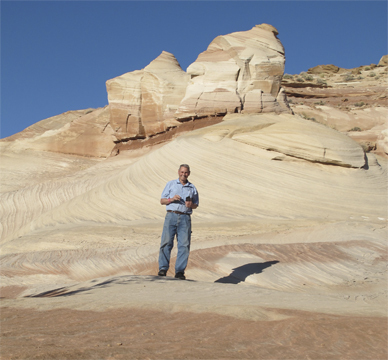 (yep, I did work in a picture from the trail head at Paria Canyon – Clyde was in the area and gave me a lift to the beginning of the walk – My truck was 40 miles down river). I run about 50 hives. 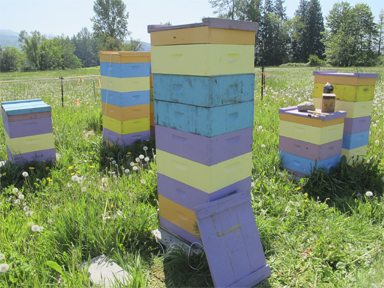 These hives are in a number of bee yards in eastern Whatcom County, Washington, where I live. About half the hives are in agricultural lands. The other half is up-river in the foothills of Mt. Baker (where my farm is located). 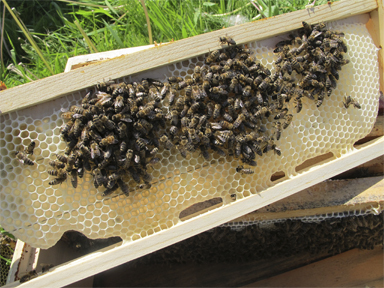 I only use medium boxes (“westerns”) in my beekeeping – no shallows or deeps. Both foundationless and half-hung frames were wired in my usual way. The half-hung foundations are pretty straightforward. I cut each wax foundation in half, then mounted it on the frame and hot-wired it to the top wire. The foundationless frames were a bit more time and space consuming. 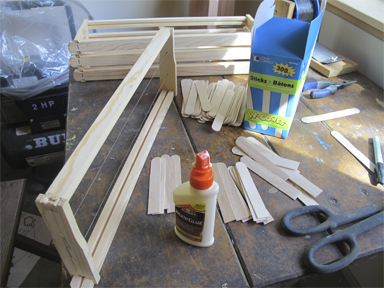 I used wood glue to secure large Popsicle sticks (bought at a craft store), into the top groove of the frame. The time is in waiting for the glue to harden. With half-hung it’s: hot wire wax foundation, then foundation goes in box. With foundationless it’s : turn frame upside down and wait for the glue to dry. 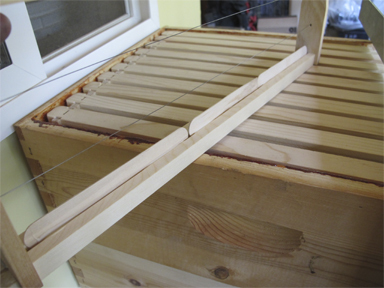 Each hive got one foundationless frame and one half-hung frame. These frames were put in at positions 2 and 9 in my ten frame hives. Each type of frame was hung between two drawn foundations (that’s important). They were never put next to each other or next to a sheet of foundation. About 10 days later I returned to some of the hives, because I wanted to split them. This gave me an opportunity to see how the experiment is progressing. 1) We are in the middle of a large “honey flow” : lots of flowers, lots of nectar. 2) The hives I checked were the strong hives from which I had chosen to breed new queens, and/or were in dire need of being split before they swarmed. 1) Both the Foundationless and Half-Hung frames were being drawn out. The degree varied from hive to hive. Half-Hung Foundation on a stronger hive. Hive “A” for this post. 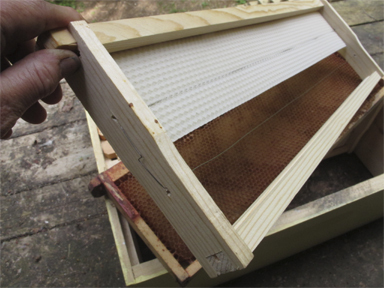 A smaller hive’s work with half-hung foundation. Hive “B” for this post. 2) Both types of frames were straight as can be – I attribute this to having drawn foundation on either side of each frame. See above images. 3) The bees did draw out the Half-Hung frames faster than the foundationless. See above images. 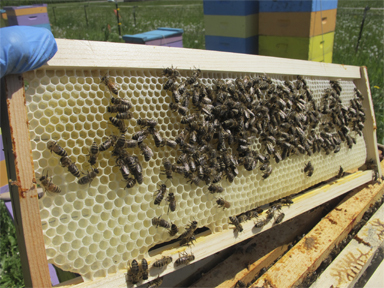 4) Foundationless frames were all drone-sized cells (many filled with honey). See the second and fouth image above. 5) Half-Hung frames were worker-sized cells on top (where the foundation was) and drone-sized cells on the bottom. It will be interesting to see if this influences the mite counts. See the first and third image above. 6) Regarding points 4 & 5 : These frames are in positions 2 and 8, where bees tend to build drones. (I shall drop some towards the center on a checker boarded hive soon, and see what that produces – the link is to a very nice explanation of how to checkboard a hive from Honey Bee Suite ). So far so good. I’ll make up some more half-hung, and foundationless (if I have the time for the latter – time and space needed for drying are a pain. 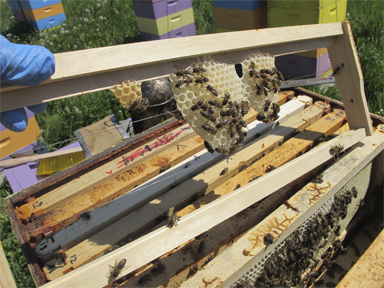 1) If the foundationless and half-hung frames seem to have an effect of bee health. 2) If they have an effect on mite counts. 3) If the bees continue building them during a standard honey flow. 4) If weaker hives and nucs build on them. Are you trying anything new this year? If so do share what you’re doing and the results – it’s great when we can all learn new things together. Also, if you have any words of wisdom about Foundationless or Half-Hung hives please share. The good sides, the bad sides…. That’s the news from Brookfield Farm Bees And Honey – outside of the frames, I’m splitting hives, raising queens, doing farmers markets, and have brought in a Livestock Guard Dog Puppy, and three Muscovy Ducks (I’m new to ducks). These latter came from my beekeeper friend Lisa at Round Tuit Farm . Check out her farm – and honey – on her website and at her farmers markets. This entry was posted in Beekeeping, Hive Components and tagged Beekeeping, Brookfield Farm, foundation, foundationless hives, half-sheet foundation, how to, Maple Falls, Washington. Bookmark the permalink.